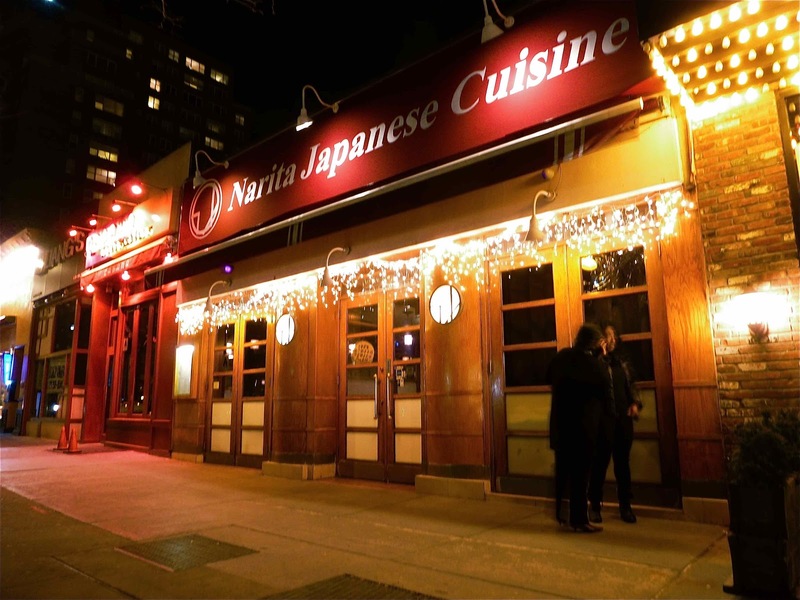 If there's one thing that Forest Hills doesn't lack, it's Japanese restaurants, though those numbers dwindle once you cut out the ones that are primarily sushi bars. Narita on 70th Road, between Austin Street and Queens Boulevard, is less a sushi bar (though they do have sushi) than it is the kind of place you'd go when you want something hot. 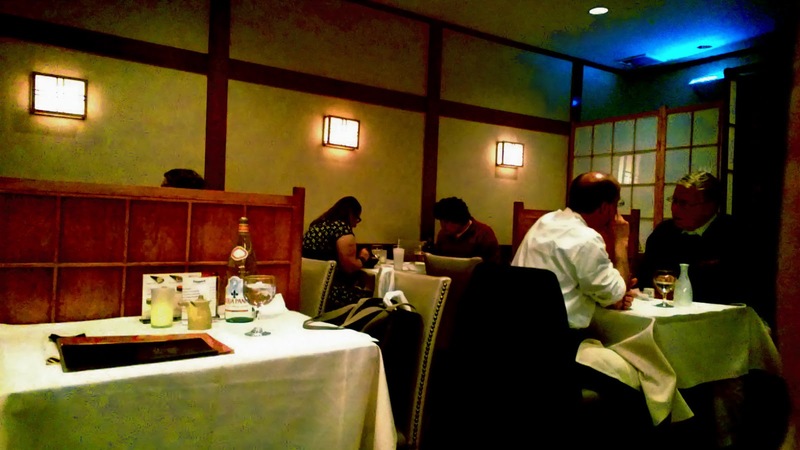 Diners enter through a traditional Japanese sliding door and are given a wide range of dining options. You can sit at the sushi bar, sit at a standard western table, sit at a kotatsu table (the very low-to-the-ground tables), or grab a seat at the hibachi. Soon, a waitress will arrive with hot towels, which, even if they don't really clean your hands at all, are a nice relaxing way to start your meal. Pike and I ate here twice recently, both times midweek, and both times Narita was neither packed to the brim, nor deserted. 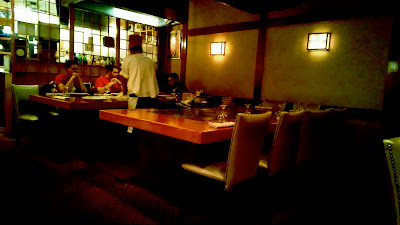 Lively would be a good description, especially considering that every so often, a fireball would erupt from the hibachi table. 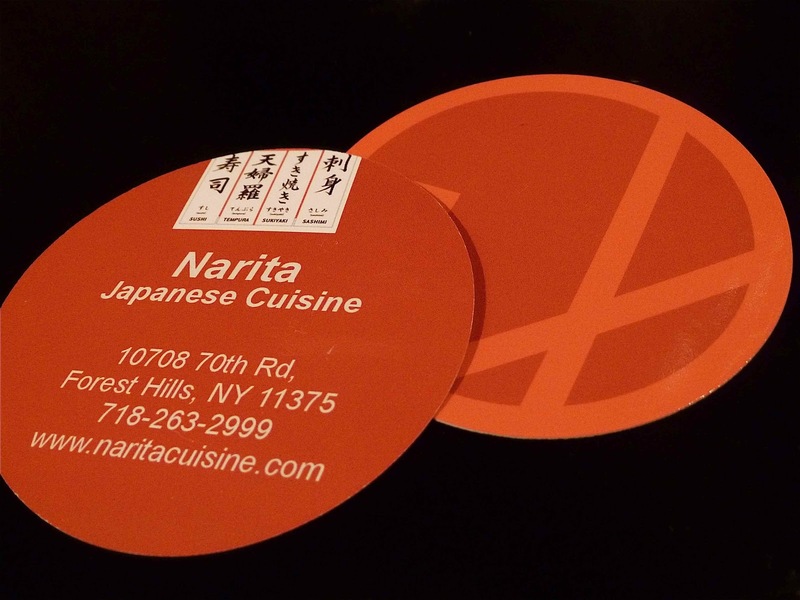 As I said, we dined at Narita twice. The first time, I ordered sashimi and it was fine, but really only because I wanted to eat healthy. Looking at the menu, I felt bad. I could get sushi at literally ten other places in the area. From now on, I said to myself, Narita was where I would go when I wanted a Japanese dinner that wasn't cold and when I wasn't interested in making the the schlep to over to Katsuno. Pike loves oysters so he ordered the Kaki-Fry. 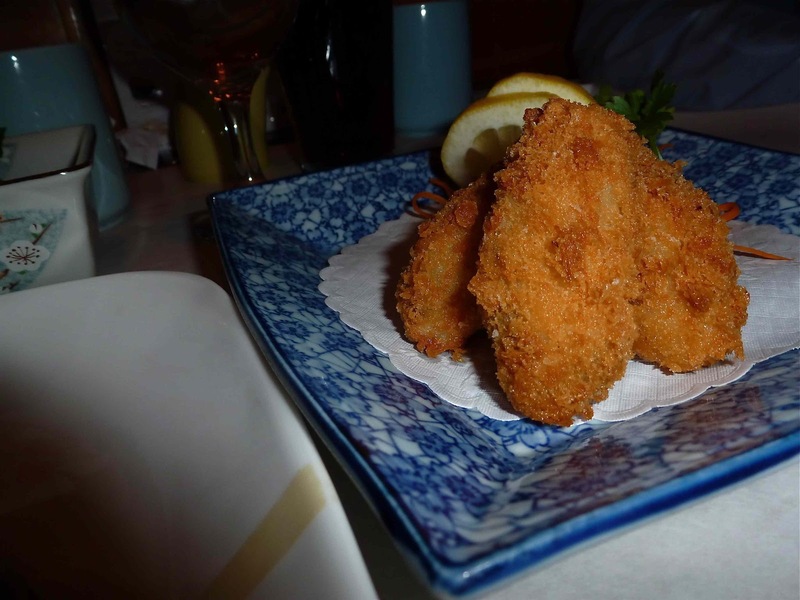 Nine times out of ten, if you deep fry something, it just gets better. This was that tenth time. The oysters were squishy and overly breaded, in my opinion. "One thing I hate", Pike began, "is when people criticize seafood for tasting fishy. Of course it tastes fishy! It's fish! That said, I will now hypocritically criticize these oysters for tasting too fishy." I would have said that they tasted too much like salt water. Boiling hot salt water that you finished eating largely because something died for the privilege of served to you. On the other hand, my appetizers (yes, I ordered two) were both pretty good. I got the Beef Negimaki and the Baby Tako. 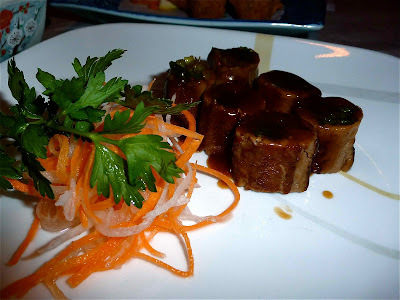 Beef negimaki is thin strips of steak wrapped like a sushi roll around a cluster of sauteed scallions and under a sweet honey-ginger soy sauce. It's hard to imagine this tasting bad and it didn't disappoint. 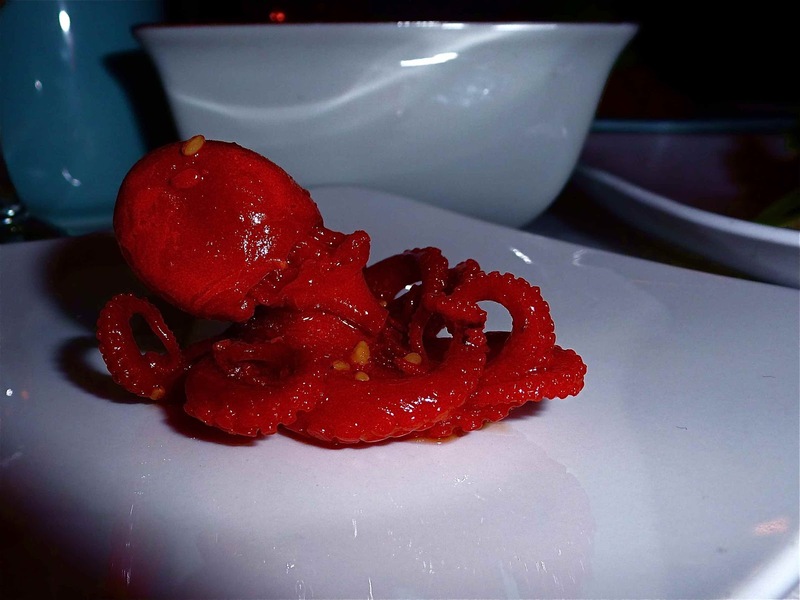 The baby tako are baby octopus marinated in a sesame sauce. We both felt that the octopus was a little bit tougher than we'd have liked, but on the whole, I give it a thumbs up. I've met more than one person who will only eat the o-shaped pieces and won't eat the legs in a fried calamari appetizer because they find it too gross. So I'm certain that the more squeamish among you will be put off by the fact that the octopus still looks like octopus. I say man up and order it anyway. Pike's entree was the Teriyaki Combination II, which includes lobster and anything else on the teriyaki menu that strikes your fancy. He fancied shrimp. 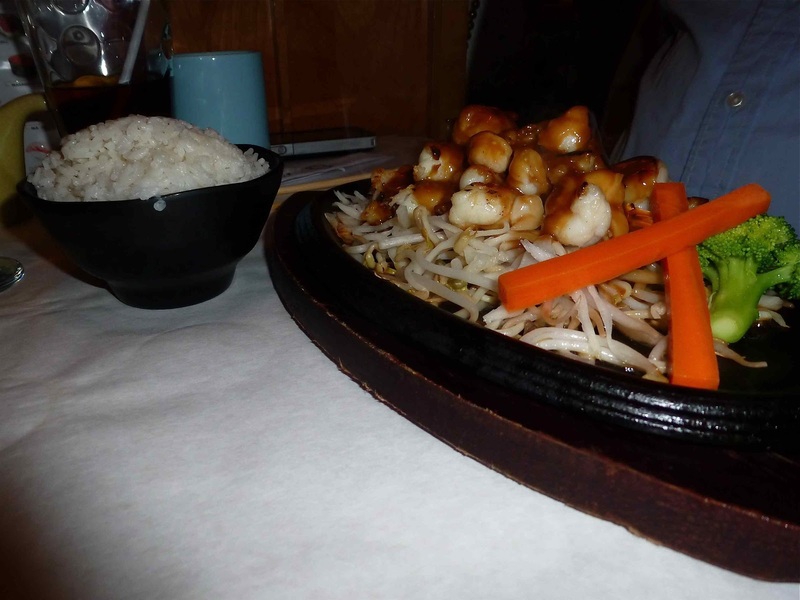 The plate is mostly taken up by bean sprouts, so you don't really get very much for your thirty bucks. Pike felt that the shrimp and the lobster were left on the grill for too long and had been burned. Admittedly, there was a noticeable ring of char to the edges of the meat, but it didn't bother me. Also admittedly, this was the second time that Pike ordered this particular entree and it wasn't charred the first time. Still, I actually kind of liked it. I felt that it gave a bit more depth to the dish. However, whether by accident or design, it's still too expensive and if for nothing else, I can't recommend it. My dinner I completely recommend. 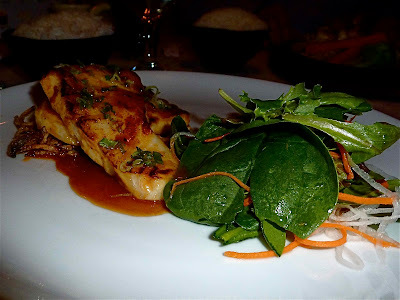 I went for the Miso Glazed Chilean Seabass, which was delicious. There was a small, bland salad that took up half the plate, but the seabass itself, served on a small pillow of fried onion, was excellent. The miso glaze was sweet without being overpowering, the fish was perfectly cooked, and since I think that I inhaled it inside of five minutes (despite trying very hard to pace myself and even recruiting my nemesis, rice, in the process) my biggest complaint was that it was simply too small. If I have any advice for Narita, it's to reduce its menu size, drop its prices a bit, and then reposition itself as a small plates restaurant where everyone can share things. Desserts at Narita were pretty standard and not very Japanese. So we skipped them. Our meal (a pot of tea, three appetizers, two entrees) plus tax and tip, came to somewhere in the $85 range.